Obesity is a highly prevalent non-communicable disease worldwide and is commonly associated with male infertility. Several etiopathological theories have been mentioned in the literature by which obesity affects spermatogenesis, thus affecting the male fertility potential. Mechanisms for explaining the effect of obesity on male infertility include endocrinopathy, increased aromatization activity, associated erectile dysfunction, psychological and thermal effects, obstructive sleep apnea, increased leptin and oxygen free radicals, and associated inflammatory and obstructive elements of epididymitis. Treatment of such a complex problem includes weight reduction (by lifestyle modification and increased physical activity), optimization of altered testosterone-to-estradiol ratio using aromatase inhibitors and/or gonadotropins, treatment of associated comorbidities by phosphodiesterase inhibitors for erectile dysfunction, and insulin-sensitizing agents for the management of diabetes. The aim of this mini-review is to highlight the pathological basis of this problem and to focus on obesity as an etiology of male infertility. Keywords: Body Mass Index; Male Infertility; Review; Obesity; Spermatogenesis. Objectives: This study sought to report 22 years experience in pediatric kidney transplantation in Oman. Methods: Electronic charts of all Omani children below 13 years of age who received a kidney transplant from January 1994 to December 2015 were reviewed. Data collected included patient demographics, etiology of end-stage kidney disease, modality and duration of dialysis, donor type, complication of kidney transplantation (including surgical complications, infections, graft rejection) graft and patient survival, and duration of follow-up. Results: During the study period transplantation from 27 living related donors (LRDs), 42 living unrelated donors (LURDs), also referred to as commercial transplant, and one deceased donor were performed. The median age at transplantation was nine years for both groups. The most common primary diagnosis was congenital anomalies of the kidney and urinary tract in 32.8% of patients followed by familial nephrotic syndrome in 20.0% and polycystic kidney disease in 18.5%. Almost half the patients were on hemodialysis before transplantation, 35.7% were on peritoneal dialysis, and 14.2% received preemptive renal transplantation. Children who received LURD kidneys had high surgical complications (42.8%) compared to the LRDs group (17.8%). Five patients from LURDs group had early graft nephrectomy and four patients developed non-graft function or delayed graft function. In addition, patients in the LURDs group had a higher incidence of hypertension and acute rejection. Graft and patient survival were both better in the LRDs than the LURDs group. Conclusions: Although our pediatric kidney transplant program is a young program it has had successful patient outcomes comparable to international programs. Our study provides evidence that in addition to legal and ethical issues with commercial transplant, it also carries significantly higher morbidity and reduced graft and patient survival. 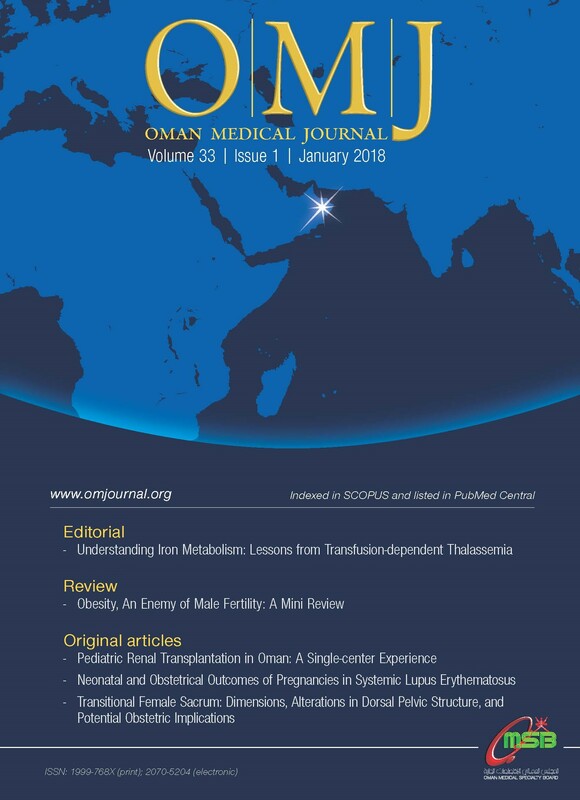 Keywords: Renal Transplantation; Pediatrics; Living Donors; Oman. Objectives: Systemic lupus erythematous (SLE) is a chronic autoimmune disease that affects women primarily of childbearing age. The objective of this study was to determine the neonatal and maternal outcomes of pregnancies in SLE patients compared to pregnancies in healthy controls. Methods: We conducted a retrospective cohort study in a tertiary care hospital in Oman between January 2007 and December 2013. We analyzed 147 pregnancies and compared 56 (38.0%) pregnancies in women with SLE with 91 (61.9%) pregnancies in healthy control women. Disease activity was determined using the Systemic Lupus Erythematosus Disease Activity Index (SLEDAI). Results: The mean age of the cohort was 30.0±5.0 years ranging from 19 to 44 years old. Patients with SLE were treated with hydroxychloroquine (n = 41; 73.2%), prednisolone (n = 38; 67.8%), and azathioprine (n = 17; 30.3%). There was no disease activity in 39.2% (n = 22) of patients while 41.0% (n = 23), 12.5% (n = 7), and 7.1% (n = 4) had mild (SLEDAI 1–5), moderate (SLEDAI 6–10), and severe (SLEDAI ≥ 11) disease activity, respectively, at onset of pregnancy. Pregnancies in patients with SLE were associated with higher abortions (42.8% vs. 15.3%; p < 0.001), gestational diabetes (28.3% vs. 10.2%; p = 0.004), polyhydramnios (7.1% vs. 0.0%; p = 0.020), previous preterm pregnancies (8.9% vs. 1.0%; p = 0.030), and intrauterine growth retardation (21.4% vs. 0.0%; p < 0.001) when compared to pregnancies in healthy control women. Furthermore, the neonates born to mothers with SLE were more likely to be preterm (28.5% vs. 1.0%; p < 0.001), have a low birth weight (< 2 500 g) (32.1% vs. 1.0%; p < 0.001), and were associated with stillbirth (7.1% vs. 0.0%; p = 0.010) when compared to neonates born to healthy control mothers. Conclusions: Pregnancies in women with SLE were associated with higher neonatal and maternal complications. Therefore, pregnant women with SLE should have their pregnancy accurately planned, monitored, and managed according to a multidisciplinary treatment schedule. Keywords: Neonatal Systemic Lupus Erythematosus; Premature Infant; Intrauterine Growth Retardation; Oman. Keywords: Facets; Pelvis; Parturition; Lumbosacral Vertebrae. Objectives: Pertussis is a highly contagious disease that causes severe and serious symptoms among infants and young children with fatalities observed in early infancy. The disease is milder among adolescents and adults. In this paper, we describe the progress made towards pertussis control in Oman and the challenges ahead to achieve control and maintain it. Methods: Pertussis data were collected between 1981 and 2015 from various sources including Annual Health Reports, annual Ministry of Health progress reports, and Community Health and Diseases Surveillance Newsletter, which provided information for the calculation of different pertussis indicators. Results: Diphtheria-tetanus-whole cell pertussis 3 (DTwP3) vaccination coverage rose from 19% in 1981 to 97% in 1992 and has been at ≥ 97% until 2015. The overall incidence of pertussis dropped dramatically from an average of 771 cases per 100 000 population from 1981 through 1985, to 21 cases per 100 000 population between 2011 and 2015 (p < 0.001). Since 1987, pertussis cases were cyclical, with peaks every three to five years with three major outbreaks reported in some parts of the country. Between 2011 and 2015, 831 cases were notified of which 785 (94.4%) met the pertussis case definition. Of these 785 cases, 625 (79.7%) were in children aged < 12 months (average rate 185 per 100 000 population), and almost all were hospitalized. Of the 625, 357 (57.1%) were aged < 2 months (average incidence of 600/100 000 population), 129 (20.6%) were 2–3 months old (average incidence of 202/100 000 population), 80 (12.8%) were 4–6 months (average incidence of 119/100 000 population), and 59 (9.4%) were 6–12 months old (average incidence is 22/100 000 population). There were 160/785 (20.3%) cases reported in children ≥ 12 months old (average rate 4/100 000 population). Downward trend rates were reported in the 5–14 year age group and a very low disease rate was observed in the > 15 years group. Since 2007, no deaths recorded were attributed to pertussis. Conclusions: Oman has a high coverage of DTP3; however, pertussis control remains a challenge among infants < 12 months old. Therefore, tetanus, diphtheria, and acellular pertussis (Tdap) vaccination of pregnant women is likely to be the best strategy for preventing the disease in infants. Keywords: Bordetella Pertussis; Epidemiology; Incidence; Control; Morbidity; DTP Vaccine; Oman. Keywords: Acinetobacter baumannii; Drug Resistance; Integrons. Objectives: To study and classify the immunophenotypic characteristics of Omani patients diagnosed with T-cell acute lymphoblastic leukemia (T-ALL) and to correlate the results with age and gender as well as biological factors (peripheral and bone marrow blast cells percentage). Methods: Fifty cases from both genders and of all ages who fulfilled the inclusion criteria with a diagnosis of T-ALL were included in the study. Correlation of T-ALL subtypes with age, gender, and initial bone marrow and peripheral blood blast cells percentage was assessed using ANOVA. Results: Among the 50 T-ALL patients analyzed, 44 were male and six were female giving a male-to-female ratio of 7:1 (p = 0.007). The average age of patients was 19.2 years with no significant differences in the three disease subtypes. No significant association was seen between the peripheral or bone marrow blast cell percentage and the differentiation stages of the neoplastic clone of T-ALL. All female patients were found to express an immature T-ALL phenotype. Conclusions: This study reports the subtypes of T-ALL in Oman for the first time. It is hoped that this will lead to a better understanding of the disease outcomes. Keywords: Acute Lymphoblastic Leukemia; T-cells; Immunophenotyping; Oman. Objectives: Organ-specific hemosiderosis and iron overload complications are more serious and more frequent in some patients with beta thalassemia major (BTM) compared with others. We investigated whether coinheritance of HFE H63D or C282Y gene mutations in patients with BTM contributes to the phenotypic variation of iron overload complications and assessed the correlation of cardiac and hepatic hemosiderosis with plasma ferritin levels. Methods: We studied 60 patients with BTM with a mean age of 17.5±9.1 years from the Northwest of Iran. HFE gene mutations were analyzed using the polymerase chain reaction-restriction fragment length polymorphism method. Cardiac and hepatic hemosiderosis was assessed using T2*magnetic resonance imaging (MRI). Ferritin levels were measured using the enzyme immunoassay method. Results: Ferritin levels showed a strong inverse correlation with hepatic T2*MRI values (r = -0.631, p =0.001) but a poor correlation with cardiac T2*MRI values (r = -0.297, p = 0.044). The correlation between cardiac T2*MRI values and hepatic T2*MRI values was poor and insignificant (r = 0.287, p = 0.058). Genotype and allele distribution of HFE H63D and C282Y mutation did not differ significantly between patients with and without hepatic or cardiac hemosiderosis (p > 0.050). However, carriers of HFE 63D allele had significantly higher ferritin levels compared with non-carriers (1 903±993 vs. 992±683, p < 0.001). Conclusions: Cardiac T2*MRI values showed a poor correlation with hepatic T2*MRI values and ferritin levels. Accurate assessment of cardiac iron overload in patients with BTM can only be done using the T2*MRI technique. Additionally, HFE H63D is a significant determinant factor for elevated ferritin levels in BTM patients. Keywords: Beta Thalassemia Major; Hemosiderosis; HFE Mutation; Ferritin; Magnetic Resonance Imaging. Objectives: We sought to identify a simplified approach for the rapid differential diagnosis of patients presenting with acute scrotum. Methods: A total of 440 patients referred to the emergency department of the University Hospital of Bern, Switzerland, with acute scrotum between 2003 and 2013 were retrospectively analyzed. Simple and multiple binary logistic regression analyses were used to evaluate clinical and laboratory parameters that may help to distinguish between genital/paragenital infection and acute testicular torsion. Results: Over half (58.4%; 257/440) of the patients were diagnosed with genital/paragenital infection, 11.8% (52/440) with chronic testicular pain, 9.5% (42/440) with acute testicular torsion, 4.3% (19/440) with a testicular cancer, and 2.5% (11/440) with symptomatic distal ureterolithiasis. In multivariate analysis, a positive Prehn’s sign was predictive of testicular torsion, whereas fever, dysuria, high leucocyte counts in blood and/or urine, high blood C-reactive protein, and burning pain were predictive of genital/paragenital infection. Color Doppler ultrasound did not help to distinguish between torsion and infection. Conclusions: An accurate diagnostic pathway helps to correctly distinguish between the possible causes of acute scrotum. However, none of the examinations performed could reliably distinguish between acute torsion and other causes of acute scrotum. Therefore, immediate surgical exploration of the testis is mandatory if torsion cannot be ruled out. Meningococcal meningitis has a wide range of neurological complications. However, cerebral venous sinus thrombosis (CVST) following infection with Neisseria meningitidis is uncommon. We report a case of CVST in a 42-year-old male admitted with meningococcal meningitis. The patient was managed with antibiotics. Due to altered coagulation parameters observed in fulminant cases of meningococcemia, deployment of anticoagulation therapy, which would otherwise be the treatment of choice for CVST, is a dilemma. Keywords: Meningitis, Meningococcal; Sinus Thrombosis; Anticoagulants. Idiopathic (Bell’s) palsy is the commonest cause of unilateral facial paralysis in children. Although being idiopathic by definition, possible infectious, inflammatory, and ischemic triggers have been suggested. Bell’s palsy is thought to be responsible for up to three-fourths of cases of acute unilateral facial paralysis worldwide. The diagnosis has to be reached after other causes of acute peripheral palsy have been excluded. However, it is rarely described in neonates and young infants. Steroids may have some role in treatment, but antiviral therapies have doubtful evidence of benefit. Prognosis is good, though residual dysfunction is occasionally encountered. We report the case of a two-week-old neonate with no prior illnesses who presented with acute left facial palsy. Clinical findings and normal brain imaging were consistent with the diagnosis of Bell’s palsy. The patient had a good response to oral steroids. Keywords: Bell’s Palsy; Facial Nerve; Neonate; Prednisolone. Obstructed hemivagina and ipsilateral renal anomaly (OHVIRA) syndrome is a rare congenital abnormality of the female urogenital tract. We reported OHVIRA syndrome in a 15-year-old girl, who was referred to King Faisal Specialist Hospital and Research Centre, due to hematocolpos and an imperforate hymen. The patient was diagnosed as having an absent right kidney since childhood. She presented with progressive development of lower abdominal discomfort and an abdominopelvic mass. She had no history of urinary complaints. Here, we describe our findings from the abdominal ultrasound and magnetic resonance imaging. Keywords: Renal Agenesis; Urogenital Abnormalities; Uterus Didelphys. Fine-needle aspiration cytology (FNAC) is a simple, non-invasive diagnostic modality which can be performed with ease on any superficially palpable lesion. Surgical scar endometriosis is a rare entity which presents as an abdominal lump in women of reproductive age. It is often a diagnostic pitfall for clinicians due to its nonspecific symptoms. It displays characteristic morphology, which needs to be identified and recognized by a cytopathologist for accurate diagnosis. FNAC can be used as a key diagnostic tool in cases of abdominal wall mass for appropriate patient management, thereby avoiding unnecessary diagnostic procedures. Here, we report the case of a 35-year-old woman who presented with an abdominal lump where FNAC played a vital role in the patient’s management. Keywords: Scar; Endometriosis; Biopsy, Fine-Needle. Keywords: Hand Hygiene; Observation; Validation Studies; Qatar.